Why Do Few People Know the History of Northern Slavery? Marc Howard Ross is the William Rand Kenan, Jr. Emeritus Professor in the Department of Political Science at Bryn Mawr College. After many decades of neglect, the story of slavery in the North is reentering collective memories in the region. 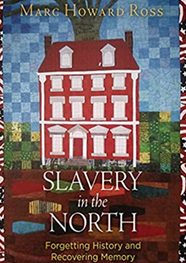 This motivated two questions that I write about in my recent book, Slavery in the North: Forgetting History and Recovering Memory: How and why was the enslavement of tens of thousands of people in the region forgotten, and how and why has it recently been partially recovered? I, for one, must admit that despite have grown up in New York—the colony and state with over 20,000 enslaved people (12% of its population) on the eve of the American Revolution—I had virtually no awareness of slavery’s existence in New York or in any of the other Northern colonies and early states. In high school and college, although I had taken a number of American History courses, I never learned anything about it. Clearly, its existence clashed with the widespread popular belief that slavery was exclusively a “southern problem.” As I learned, my case was far from unique. Few Northerners had any awareness of slavery’s earlier existence, and even when they did, what they knew was often very minimal. In fact, Northern slavery was significant. It lasted from 1626 until 1865—246 years— and involved tens of thousands of people. Merchants from Rhode Island, New York and Boston were the largest North American slave traders in the colonies and early states. The wealth they earned produced the country’s early elite and funded the region’s first industries and universities. Explaining how something that significant virtually disappeared from the region’s collective memory was at first challenging. Thinking about the South in comparison with the North helped begin to answer this puzzle. In the states of the Confederacy, there are at least three clear differences from North that help us understand the difference in the collective memories of slavery in the two regions. The first is that the South has maintained narratives (often under the rubric of the “Lost Cause”) to explain the loss of the Civil War and their way of life including slavery. Second, there were many ritual expressions and enactments such as films, books, dramatic productions, museum exhibits, memorials, monuments, public holidays, parades, historical sites, and music that told the story of the Civil War and slavery from that perspective. Third, the region’s public and ceremonial landscape makes visible the antebellum period’s lifestyle and emphasizes the valiant battle for succession. Central to this are the memorials and monuments that are located throughout the region as well as the many Civil War battlefields that are now historical sites that attract many visitors each year. There are also many plantations that once had hundreds of enslaved people living and toiling on them that offer visits. Until recently, few talked about the lives of the enslaved on tours, but in recent years this has greatly changed in some places, as I learned on visits to Virginia, North Carolina and South Carolina. In contrast, the North was almost completely devoid of all three—narratives, ritual expressions and enactments, and visibility on the public and commemorative landscape. Even the few rare examples were often very limited. The African-American Museum in Boston has long told the story of Crispus Attucks, a Black man who was the first casualty of the Revolutionary War. However, when I visited it and took the Black History Tour there in 2015, I heard nothing about the existence of slavery in Massachusetts from the 1630s until 1800. Instead there was an emphasis on 19thcentury opposition to slavery and especially to the 1850 Fugitive Slave Act. In contrast, the Royall House in nearby Medford, Massachusetts, which in the 18thcentury it was the home of the largest slave owner in New England, is a now a historical site that incorporates the history of enslavement on the site and discusses what they know about the lives of the enslaved there. New Yorkers recently learned about slavery in the city in the 1990s with the rediscovery of the African Burial Ground in lower Manhattan that was originally located outside the city walls when it opened in the late 17thcentury. The discovery of the site resulted from a mandatory archaeological dig when the Federal Government decided to construct a new General Service Administration building on the site just off lower Broadway in 1989. It was widely assumed that little of historical significance would be turned up because the area had been so actively developed and redeveloped since the early 1800s, but the dig on the site found that there were the remains of between 15,000 and 20,000 people buried there. Over 400 remains were exhumed for study that turned out to be very productive. There was a contentious battle, however, over how to memorize the enslaved interred there. Eventually, the government funded a very impressive memorial, reinterred the remains of those who had been removed, and opened a National Park Visitor Center to tell the story of the site and of slavery in New York. When I visited it in 2011, I was struck by the number of white and Black visitors who were shocked to learn about New York’s history of slavery. This was the same reaction I heard at the New York Historical Society on a visit to see their impressive exhibit on “Slavery in New York” in 2005. So why and how did the North manage to forget its long history of slavery? This happened in part due to gradual attrition as events as become more distant over time. But this is not sufficient, as we see in the case of the South. There is also the destruction or modification of sites associated with slavery; intense shame and guilt that leads Black and white descendants to repress memories; fear of social sanctions from others for recounting painful memories; reframing narratives about the past in ways that omit what makes people and communities embarrassed and uncomfortable; and incentives to forget a painful past. Each of these helps us understand how history is a social construction that fits the needs of people in the present and is not a stable in terms of what people know and how they know it.